The Spartan helots were the serfs of ancient Sparta, they were owned by the state and used by the Spartans for various purposes and tasks. The helots are believed to have been laconians that was brought to service by the Spartans when their needs for farmers to grow food, and support the growing Spartan community arose. During wartime the helots would be called upon to help in battle, if not fighting then they would at least act as a servant to each hoplite, assisting them when required. It also thought that the helots of Sparta had what was a unique opportunity of the time for a slave. Helots who showed themselves to be exceptional in battle or trustworthy in their duties could sometimes earn what would be considered a promotion. The true origin of the name Helot is truly unknown but a common theory is that is relates to the village of Helos, located in the south of Sparta where it is thought that the first Laconian slaves would be formed under the state of Sparta. It was after the First Messenian War that started in 743 BC and lasted for around 20 years, that the Spartans would claim the Messenian people as their helots. Any Messenian that didn’t escape, move or travel to a new land would be declared a helot, a worker for the Spartan state. The future family and children of the Messenian people that become helots would find their offspring born into this new role as a servant to the might state of Sparta. Thus the population of helots in Sparta soon grew to a considerable size, much larger than the full citizens, the Spartans. While slaves in other ancient Greek states was far less favourable for the slaves, the helots were considered to be treated with more favour in Sparta. It is known for example, that while the helots would farm and grow produce to provide to the Spartan citizens, they would also be allowed to keep sufficient crops for themselves. The amount divided in some cases is told to be an entire half of their crop. Helots in ancient Sparta also had the benefit of being able to live as a family, a helot could have a wife or a husband, and even children. In fact the reproduction of slaves in Sparta was not as tightly controlled as in other Greek states, and it’s considered that the Helot population grew over the time they worked for the state. In addition to keeping their family life, the helots would in most cases keep their own homes, they could buy and acquire land and even kept their own choice of language, customs and many other freedoms. As mentioned earlier, there was even a system of promotion for Helots in Sparta, an opportunity for a helot to escape his form of slavery. Successful helots might be moved up to a rank known as Neodamodeis which is essentially Greek for ‘made one of the community’. While the exact benefits of being a Neodamodeis are largely unknown, but its widely though that the helot who would once have served as a hoplites assistant in war would receive somewhat of a promotion. Some Neodamodeis would be assigned more trusted tasks, its though they would even perform guard duty on what Thucydides called their path to freedom. The helots would in time eventually revolt against their captors, the Spartans. 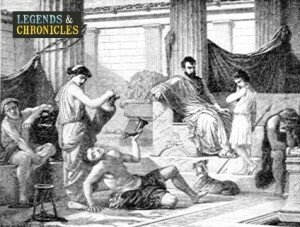 While the helots were treated better than some slaves in Ancient Greece, the life of helot was still one of servitude. The helots would bide their time, await an opportunity to lead an uprising against their captors and try to claim back what was once theirs, their freedom. The first revolt by the helots against Sparta came in what was deemed The Second Messenian War, and was believed to have started around 685 BC and lasted all the way till 668 BC. The war would start with the help of the Argives giving support to the Messenian helot people in their battle. Aristomenes was a hero and king of Messenia and was largely responsible for the second Messenian War. Aristomenees is mentioned as the leader in many references of the Messenian forces who invaded Laconia in an attempt to fight back for their previously lost freedom. Artistomenes himself was captured in battle, the Spartans looking to gain the upper hand actually paid off some of the Messenian allies lead by King Aristocrates of Arcadia whose forces would retreat when Sparta attacked leaving Aristomenes vulnerable. After his capture, he would eventually escape and retreated back to Eira which was held from Spartan conquer for more than a decade. The helots did eventually manage to free themselves from Spartan rule in what is thought to be around 350 BC. This was when ancient Sparta was in a much weakened state after the Peloponnesian wars. Sparta had lost much of its power over the surrounding regions and the helots finally took this opportunity to once again be free.